Monday Jan 10: as our three weeks with Benj draws to a close we marvel at the amount of sailing we’ve been able to do and the excellent weather we’ve enjoyed. 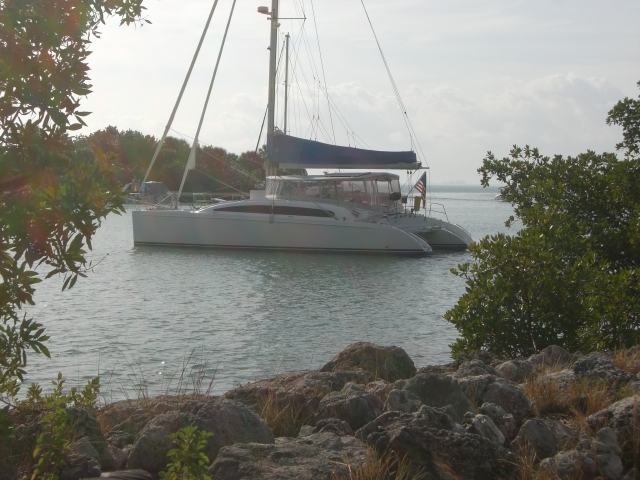 Another all-sail day brought us to No Name Harbor near the tip of Key Biscayne in the Bill Baggs State Park. The harbor is well protected and small; about a dozen properly distributed boats can anchor with a shorter than typical scope. Not a problem if winds are less than 15kts. Boats can also tie up to the seawall for daytime use only at a cost of $2. Anchoring overnight costs $20. Payment is on the honor system. While there we used the pump out machine; no charge but do-it-yourself. The Boater’s Grill sits at the eastern end overlooking the harbor. We took advantage of the walking trails to explore and even made a short stop at the beach on the east side of Key Biscayne. Tues started off foggy- again with no warning- but our plan was to leave after lunch. The Park is huge and offers something for everyone: walking trails, bike paths, small piers/overlooks for fishing and gazing out over Biscayne Bay, benches, beach, playground, tons of picnic areas, the Cape Florida lighthouse and places to kayak. A Great White Heron gave us a splendid show of how he waits for and catches fish. Lizards, raccoons, butterflies, squirrels and a snake all were spotted as we walked the paths Tuesday morning. Stiltsville: ah now we know what those house-like buildings are that we saw when we passed by the tip of Key Biscayne on Dec 23. Back in the 1930s and ’40s that shallow area held over 25 of these as summer cottages, fishing and boating clubs. About seven still remain and they are now part of the State Park. Heading north in Biscayne Bay, the tall but colorful Miami skyline loomed closer as we made our way (a short 11 mile trip) to our spot by the Venetian Causeway off Miami Beach. Groceries and water required immediate attention; luckily both are easy in SoBe. Wed was overcast and the wind picked up; a day on the boat was in order. We got caught up on stuff, Benj finally got his Spring semester books ordered and we figured out where to get the Airport Flyer bus to Miami Int’l. It’s a great deal, only $2.35 per person one way, to go from South Beach to the airport, a 30 min trip with 4 stops along the way. Fortunately the flight was Thursday and not Wednesday; the day of the snow storm which dumped nearly two feet on much of CT. Wednesday’s flight was cancelled; Thursday looked like any other not-too-busy day at the airport. Miami weather was chilly and windy as we headed out at 7:30 to dinghy in and walk 18 mins to the bus stop. This entry was posted in Uncategorized and tagged miami area. Bookmark the permalink.